One of the best beaches in the world located on the island of the Bahamas. Local people call it North Beach, but the beach is also known as the Pink Sands. 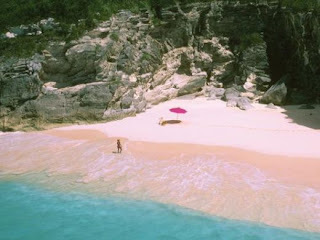 Naming a Pink Sands beach is certainly not without reason. Unlike other beaches in the Bahamas yellowish sand, this beach has a reddish-colored sand. The texture of the beach looks like a sugar coating and soft as a feather when walking or lying down on it. There was no gravel, sharp rocks, boulders, and the ditch on the edge of the beach. Seaweed is also not found either on the surface or in the water. Due to the Pink Sands became the main moneymaker Island, private companies and local authorities to keep the region in order to always look clean. One appeal of the beach is located on the back of the towering hills and cultivated plants such as weeds, lilies, and lavender that create a background of the beautiful flowers. Around the coast there are the hotels and villas of high quality and reasonably calculated for the upper classes. One is Pink Sands Resort is a first class hotel managed by Australians. Located not far from the capital, Dunmore Town.